US demand for battery and fuel cell materials is expected to grow 4.3 percent annually through 2017 to $6.1 billion. Polymers and chemicals will lead gains. Material usage in secondary batteries will outpace that in primary batteries, while fuel cells will be the fastest growing application overall from a small base. 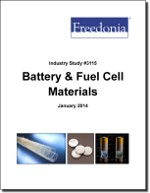 This study analyzes the $4.9 billion US battery and fuel cell material industry. It presents historical demand data for 2002, 2007 and 2012, with forecasts for 2017 and 2022 by type (e.g., metals, chemicals, polymers, carbon/graphite), function (e.g., active materials, current collectors, containers, electrolytes) and application (e.g., alkaline, primary lithium, zinc-air, lead-acid, rechargeable lithium, nickel-metal hydride, nickel-cadmium, fuel cells). The study also considers market environment factors, details industry structure, evaluates company market share and profiles 35 industry players, including Exide Technologies, Eco-Bat Technologies and Doe Run Resources.